Malcolm Toft, the man behind countless classic consoles, turns his expertise to building a high-quality and remarkably flexible bass processor. Malcolm Toft scarcely needs introduction; his career as a recording engineer began four decades ago at Trident Studios, and the mixing consoles he has designed since — both for Trident Studios and, later, under brands including Toft Audio Designs and Ocean Audio — are all highly regarded and still in use in studios all around the world today. His latest project is a company called Bassics, whose first (and, at present, only) product aims to make the sound of those consoles available to the gigging and recording bassist. The BPA-1 is a pedal-format bass preamp, designed either to sit between your bass and amp/combo, or as a direct interface between your bass and a recording system or PA. I say ‘bass’, but that should be ‘basses’, because the BPA-1 actually has two instrument inputs, with a switch on the top of the unit determining which is active. Both inputs get their own input control (input 1’s is on the top panel while input 2 has a trim knob around the back), allowing you to match the levels to avoid jarring volume hikes when changing instruments. Input 1 can also be switched between high- and low-impedance modes, to suit magnetic or piezo pickups (eg. for a double bass), and a four-LED meter shows the overall input level. After the input stage comes the EQ section, which comprises three semi-parametric bands in which the range of frequencies under control have been carefully chosen to provide maximum control over bass guitars. The bands are called ‘Low Bass’, ‘Mid Bass’ and ‘High Bass’, and each offers ±15dB gain across the ranges 45-250 Hz, 150-800 Hz and 500Hz-3kHz, respectively. Unusually, each band can be individually engaged or bypassed via three footswitches, and the entire EQ section can be bypassed in one go courtesy of another footswitch. To help you keep track of which bands are engaged or not, the knobs are backlit with colour-coded lights which illuminate when active. A further four-LED meter shows the level going through the EQ section, to help prevent internal clipping. Next comes the compressor, which is a VCA design, the fixed attack and release times of which have also been optimised for bass guitar. This is governed by a single knob, which simultaneously lowers the threshold and applies make-up gain when turned up. A final four-segment meter shows the amount of gain reduction being applied and, like the EQ controls, the compression knob is illuminated when active or extinguished when bypassed, via a footswitch. A further switch allows you to place the compressor either before or after the EQ section. The final top-panel controls comprise an output level knob (again, with a meter to show the output level) and a mute footswitch. Around the back of the unit is a glut of I/O connectors. 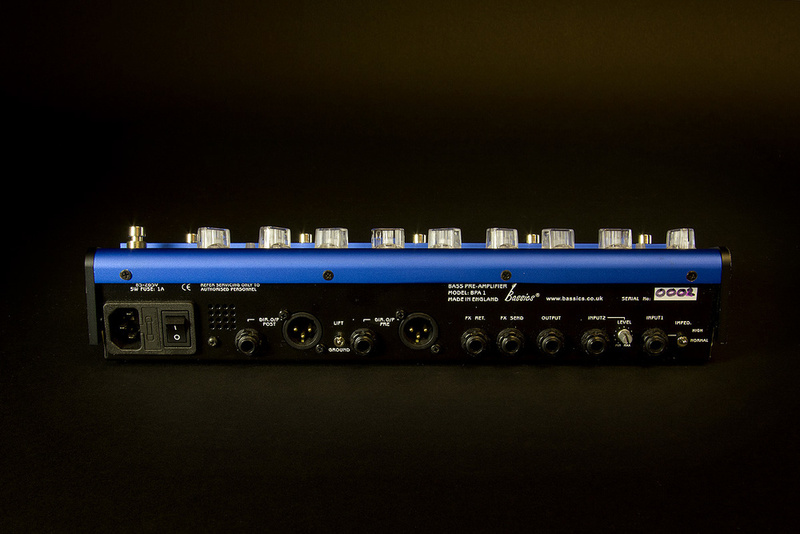 In addition to the two input jacks, there’s an instrument-level output jack for connecting to an amp, a pre-EQ effects loop, and a further pair of direct line-level outputs duplicated on jack and XLR, one of which offers a post-processing feed and the other a ‘dry’ signal. The BPA-1 is a reassuringly sturdy device; all the footswitches have a positive (and silent, in terms of audio-signal noise) action, and although the knobs have a small amount of ‘wiggle’ to them, I’m sure they’d withstand the occasional misplaced foot or light drop. The illuminating knobs are also extremely handy on dark stages for showing you at a glance which processing elements are active or not, and the fact that you can switch individual EQ bands on and off, as well as switch the whole EQ section in and out, gives you an enormous amount of flexibility. For example, you can leave the EQ switched out on double bass, then switch certain bands in on electric, or use the global EQ switch as a bass and/or mid boost, and so on. The EQ bands are also very well thought-out; it’s nice to have such a range of control over the lows and mids, and there’s more than enough range between the three bands to match whatever instrument you’re playing and the amp, monitors or FOH system you’re playing through. The multiple LED level meters are also extremely handy for setting the pedal up, allowing you to balance the input level, compression amount, output level, and the effect of the EQ on the compressor’s action (when it’s set to post-EQ mode). And gain-staging is made even easier by the fact that the BPA-1 seems to have plenty of headroom, both at the input stage and internally. While I was able to run both my electric and upright bass pickups hot enough to fire up the red LEDs, such clipping as there was tended to be fairly benign until I reached silly levels. The compressor is the icing on the cake, and a very useful inclusion on a device such as this. At lower levels it can usefully take the edge off any overzealously plucked notes, while at higher levels it can radically alter the envelope of every note you hit (which sounded great for funky staccato lines). The ability to switch it pre- and post-EQ also means you can either use it as a smoothing device (pre), or use it to even out the level between lower and higher strings by, for example, boosting the extreme low end so that it acts more assertively on lower notes than higher ones. Other than that, of course, there’s the price. Nigh on £450$600 is a lot to pay for a bass preamp, whichever way you spin it. However, once you consider that it includes an A/B switch, a three-band swept EQ and a high-quality compressor, it starts to make sense. And considering it gives you peace of mind in terms of the ability to get your instruments sounding the way you want on stage, and of presenting your FOH engineer with a sound you’re happy with, it starts to look like a real investment. There’s no shortage of pedal-format bass preamps that offer EQ and input switching — check out EBS, Radial, Ampeg, Tech 21 and so on — but to match the BPA-1’s feature set, you’d also need to invest in a compressor pedal. Sounds great, with plenty of headroom. Two inputs, for switching between two basses (or upright and electric). Compressor has a wide range of sounds, from gentle smoothing to assertive squashing. Illuminated knobs provide instant feedback of what’s going on, even on dimly lit stages. Input selector could have done with its own footswitch. 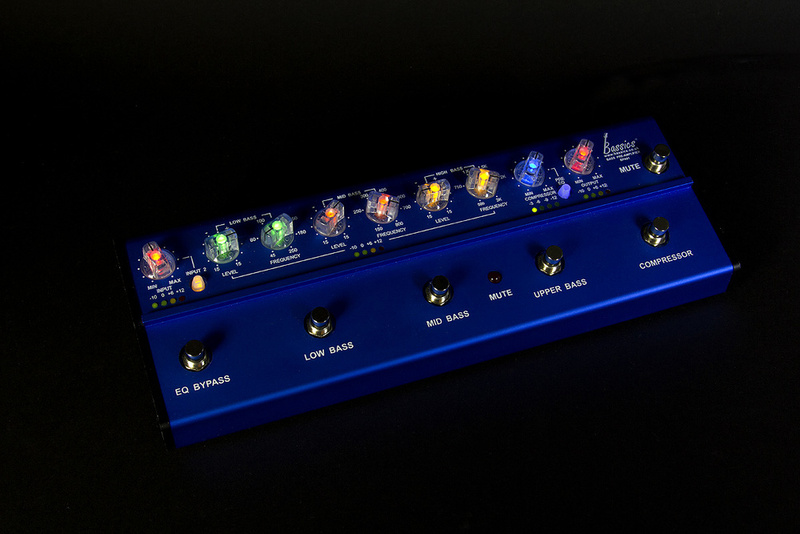 A high-quality front end for bass guitars, that combines a preamp, EQ, A/B switcher and compressor. The illuminated-knob scheme is especially handy for use on dimly lit stages.